Need to be more in your body and heart and less in your head space? Next workshop will take place in ????? ..and you see that it is affection that has been near the center of my attention. My grail quest. It is affection that is hungered for by many of the children and the kids-at-heart adults in my church, and all around my part of the world. It is affection that Biodanza classes begin and end with. That time, that space, was a brief garden. It was an awesome event!! 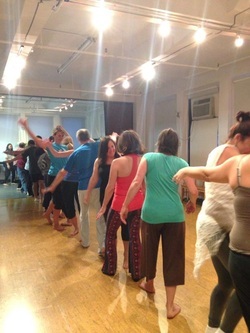 I traveled from NH and it was more than worth the distance and craziness :-) It was my first Biodanza experience and I had huge expectations... the gathering was beyond my expectations!! I absolutely recommend it!! The "vivencias" were beautiful, fun, touching, enlightening... it was just awesome!! Michelle is a sweetheart and the people that attended were wonderful and real... did I said delicious too?! ;-) Thanks for an extra-ordinary experience to all of you beautiful beings... biodanceros!! ;-) Can't wait to dance with you again!! Biodanza is an opportunity for you to be less in the head space and more in your heart space. No judgement, no mirrors, no dance steps to remember. Just you, the music and the community together in organic flow. Come experience what that feels like to tap into your body compass and body wisdom through expressive movement and no talking (during the class, at least!) and spend a day in JOY and CONNECTION! A full day experience will give you the opportunity to connect with some fun people and really get into the essence of YOU through Biodanza. Times Square NYC...come dance and shop and connect to the city pleasures!